[All photographs copyright, Gary Nunn 2012] – Some days you connect with the bird and some days you don’t. 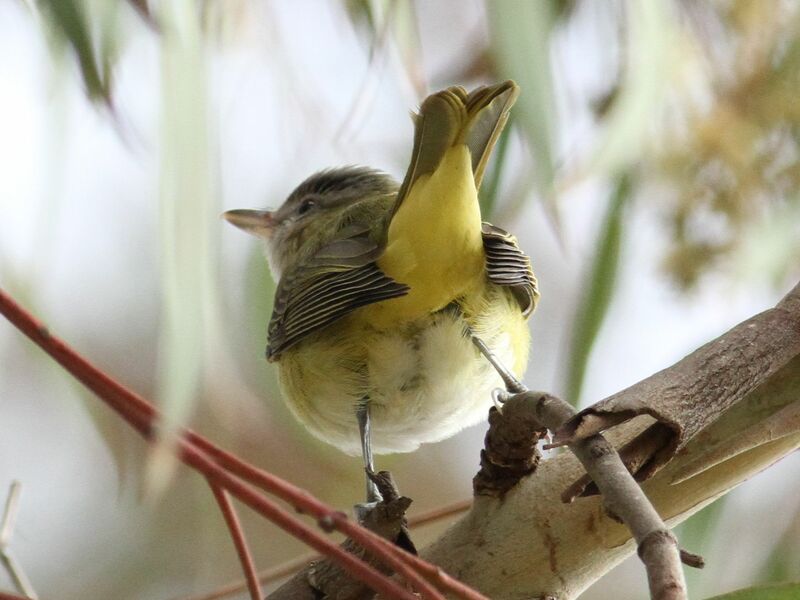 I was pretty disappointed yesterday after not catching up with the Yellow-green Vireo Vireo flavoviridis found by Sue Smith at Fort Rosecrans National Cemetery, Point Loma, San Diego. So today I headed out there early with one goal in mind! As you will see from the photographs below I did not come away dissatisfied this time around! Every part of this bird can be seen in these photographs down to the dark blackish thin eyebrow, dark brownish-red eyes, blue legs, pale graphite gray cap, glowing yellow crissum, yellow inner fringes of rectrices, the grayish pink bill, and even the small hooked tip of the upper mandible. 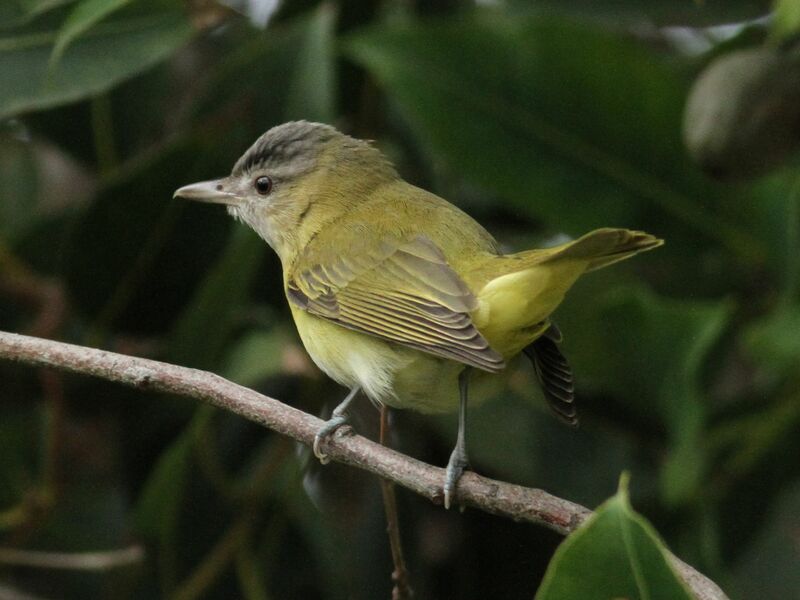 The yellowish-olive upperparts and pale gray crown indicates this is the vagrant western form of Yellow-green Vireo V.f. hypoleucus expected here in California. 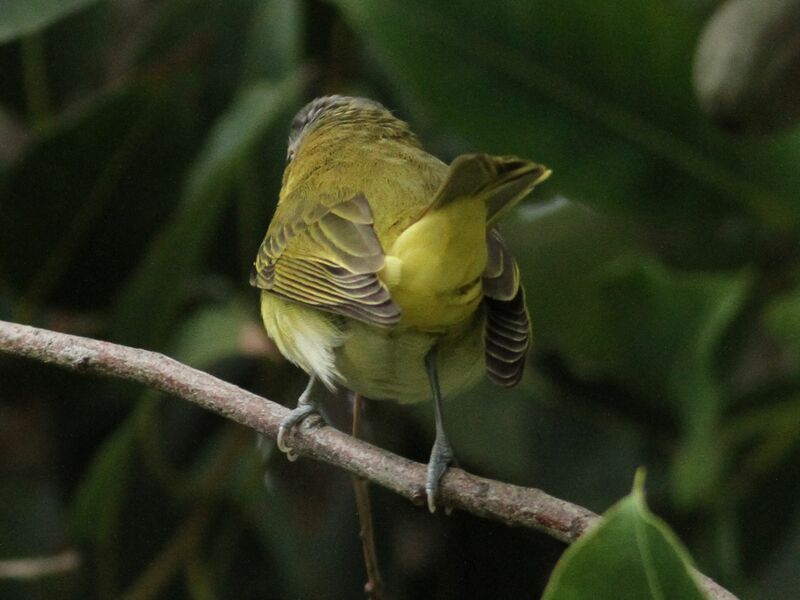 This Yellow-green Vireo is in very fresh plumage. Delicate light colored fringes edge the wing feathers and the standout yellow coloration on the underparts is bright and eye-popping. It is really just a neon light of a bird when you catch sight of it, particularly against a dark background. Even when viewing it against a bright backlighting when viewed overhead it really stands out. 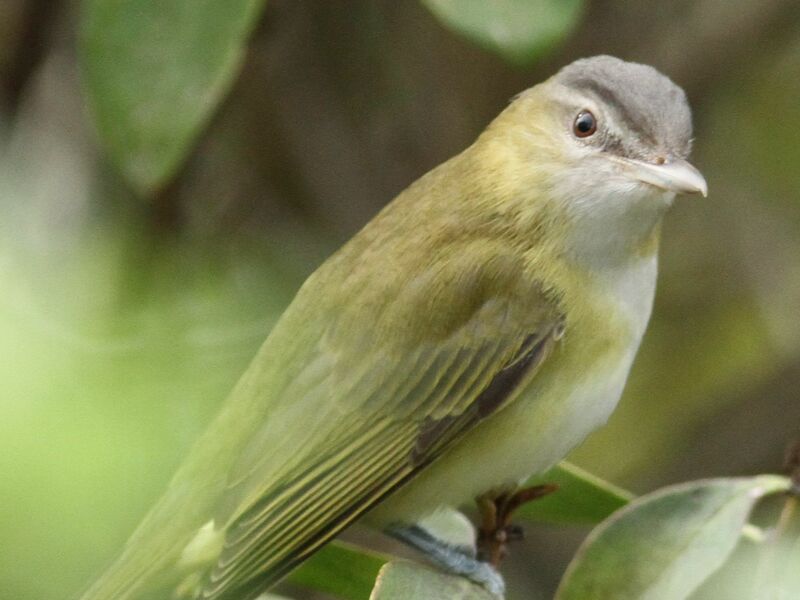 Many thanks to Sue Smith for finding this amazing looking vireo. Easily my favorite bird of 2012 so far here in the county. Records of this species are scarce in the county with less than one record per year on average. They can be real skulkers, in denser habitats such as willow beds, so catching an opportunity to photograph one out in the open was a special experience. 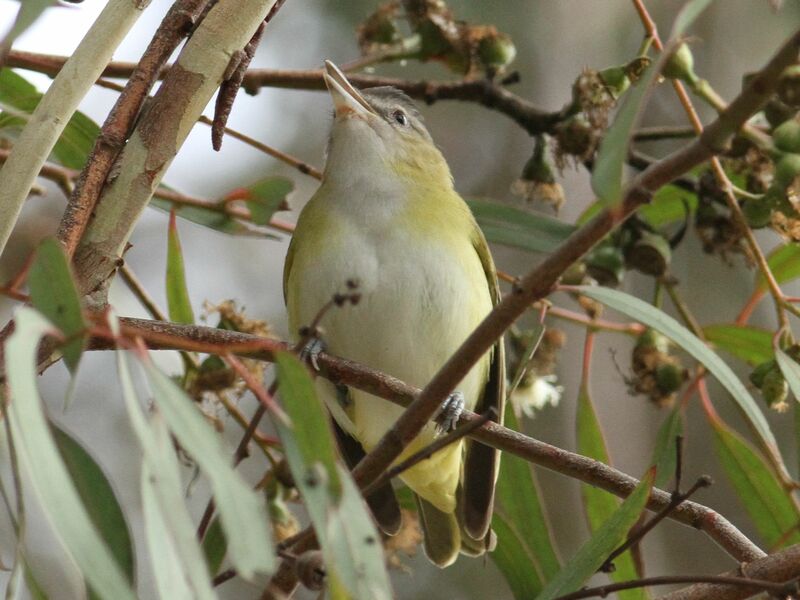 Yellow-green Vireo is a California Bird Records Committee review species with on average about three or four accepted records per year in the state. 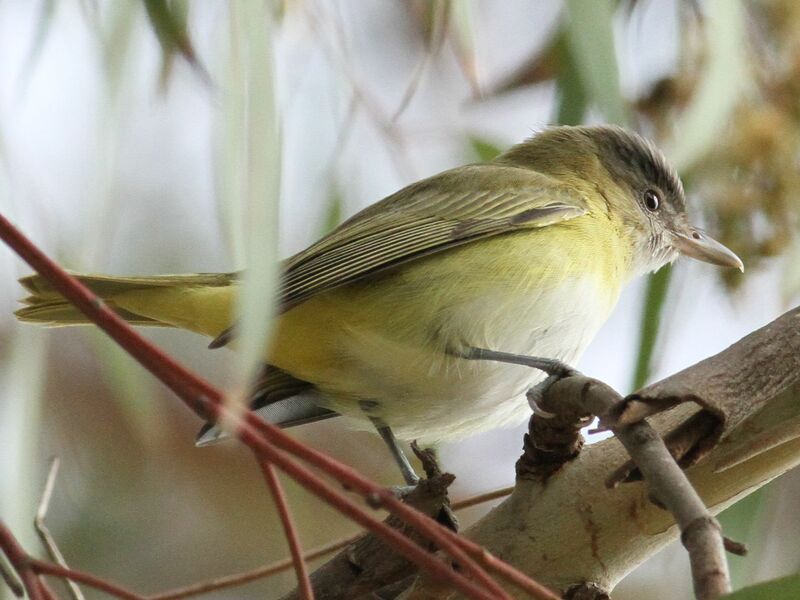 This entry was posted in CBRC Review Species, San Diego County, Vireos by Gary Nunn. Bookmark the permalink. 2 vireo seen in backyard in Escondido. Unmistakingly Yellow-Green vireo. Only seen one day flying around backyard. Found your sighting on sandiegobirding. Last Friday I was looking for the YGVI at the wall about 10:30 – 11:00. I was alone except for someone with a camera that had given up and was waiting in his car for someone on the east side to locate the bird. I saw a warbler fly from the east fence into the little tree at the corner south of the eucs. It was very windy and it might have been trying to keep out of the wind. 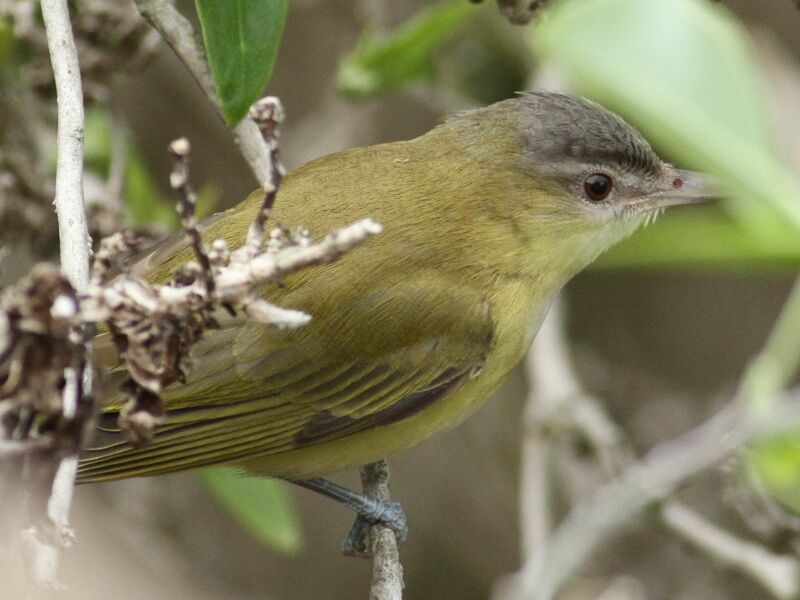 I thought it was a Tennessee Warbler since it was not a bright yellow and saw it mostly from the underside with a white eyeline and cannot say if it had a vireo bill. I was wondering if I got it wrong and what you think would be the chances it could have been the YGVI. It might be a moot matter since it has not been seen since. I am only a third-year birder and not much weight is given to my observations, but I am working on IDing the smaller birds. Your opinion would be appreciated. 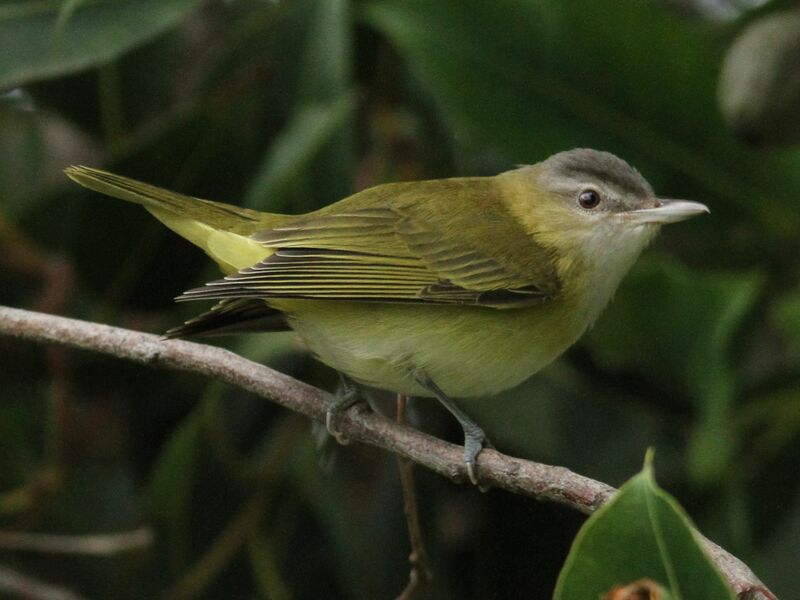 Forget my request — I now know that it was not the vireo I saw but a Tennessee Warbler. It is just a coincidence that it appeared in the same area that the vireo was spotted. I had a pair of these birds in my back yard this past weekend. I was sitting outside with my camera watching the hummingbirds. I saw this pair of yellowish green birds fly down onto a wire and look at our fountain, which was running. One flew down for a drink and I was able to take a picture. Then they both flew off. I Googled the description of the birds, and up popped the picture above. We live about 2hrs. North of San Diego, so I am surprised to see them here. Hello! 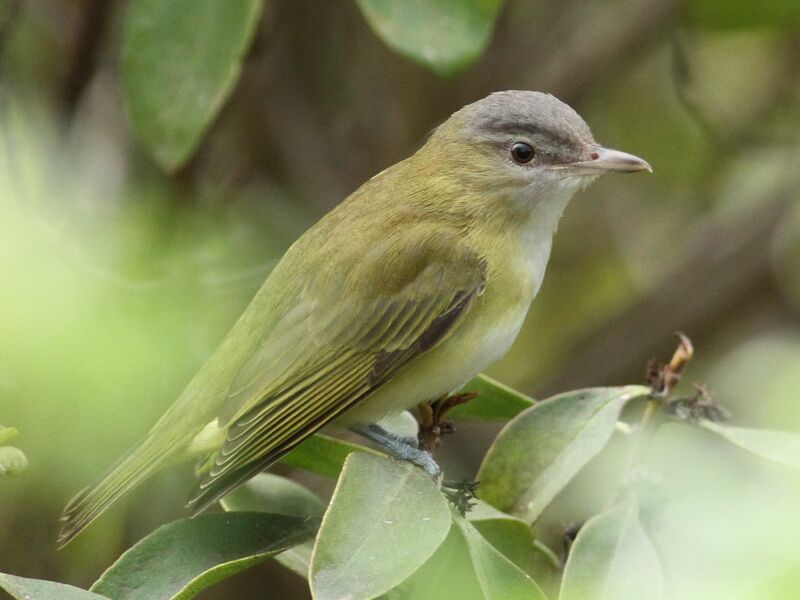 I found this page while searching for identity of a sleek, green bird, seen trying to drink from hummingbird feeders in my yard, but I don’t think it’s a vireo. Can anyone offer suggestions? The bird I’ve seen is more an “avocado” green, over most of body. I can’t tell about yellow below. It’s pretty elusive/shy except when hungry. It has a slender, sleek body, and very smooth feathers. It does not appear to be hanging around with the house finches (I also have sunflower seed feeders hanging up and on a pedestal), but it appears more intrigued/attracted to hummer feeders. I have not seen it eating seeds. I’m in North Clairemont, close to canyons. Large, mature trees in the yard make it popular with hummingbirds (4 chicks fledged from one nest so far in 2014) house finches (a few nests under house eaves), sparrows, mockingbirds, and doves. Small Coopers (?) Hawks have been seen sitting in the tree near feeders, and have even flown into the patio in search of song birds. I also have crows that like a tall pine tree- I often find odds and ends they carry into tree and drop into yard below. So, given this location and wide variety of birds- any thought on what the “greenie” is that has appeared recently? Hi Lori, the sleek green bird at your hummingbird feeders is an Orange-crowned Warbler. They enjoy a sip of nectar and can be found often feeding alongside hummingbirds in eucalyptus trees that are flowering. Similar finding in backyard with hummingbird feeders and running water. Only saw 2 birds on one day, then they were gone. It’s been about 12 days and no more birds. This looks like the birds who have decided to make a nest in my garden in San Diego. Is that likely? IS there another tiny green bird that looks a lot like this one? I have been seeing this bird for a couple of weeks. What does it eat? It has been trying to feed from my hummingbird feeder and I am worried that it might be some kind of captive bird that doesn’t know what to eat and is used to being fed from a red container when it was caged. Hi William, you are most likely watching an Orange-crowned Warbler sipping nectar at your hummingbird feeder. They commonly do this at feeders, flowers during the winter months. They go crazy for eucalyptus flowers for example. It is normal behavior for this species. Hope this helps, Gary. My husband and I saw one of these birds yesterday, May 14, 2016. We live in El Cajon, CA and from our patio we saw a light yellow bird fly up and land on the fence around the pool. It was the exact bird as shown in the photos on this page. Cool, now at least we know what the name of this pretty bird is. I recently spotted one in El Cajon it was drinking from our humming bird feeder and then yesterday spotted it the garden. That’s when I wanted to know what the name was so, thank you for sharing. I had one of these beautiful small birds fly in to my back window yesterday. It stunned itself and fell to the ground.I picked it up and cradled it in my palms for about one half hour. It showed no sign of injury or fear of me. After the half hour it flew off to a small tree in my back yard. Then took off again, none the worse for the experience. One came into my office in Vista, CA and seems to be injured. I caught it and am bringing it to a humane society today. beautiful little bird.